We do love a good tray activity in my house! I think it provides a little bit of structured play to balance out the free play. This activity is all about starting sounds and letter recognition. 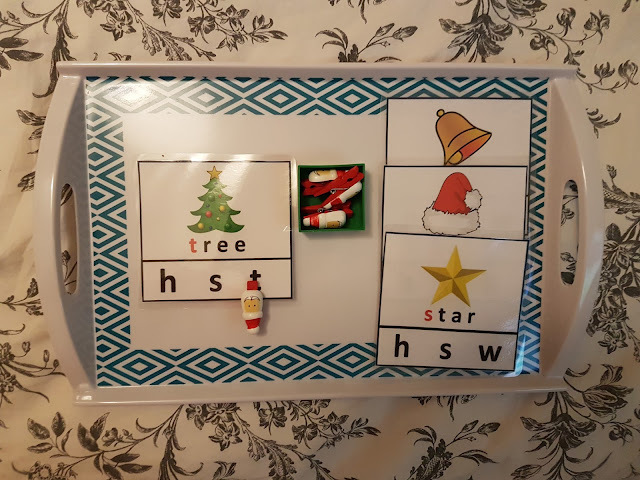 To help the children recognise the starting sound, I coloured it red and then asked them to find the matching letter at the bottom of the card. Some children pick this up really quickly while others need to work on it a few times to understand what we are asking of them. Don’t be put off if your child needs more encouragement to start with, just do a few with them and talk through what you are doing. Model by example. The cute little Santa pegs were one of my Poundland bargains. I got a pack of about 20 pegs for £1. All my Christmas Montessori printables are available from my TPT shop for FREE. Just click on this link and download what you need!